It happened that our camp site with a nice view, was not as flat as it appeared, and most of the night we end up slipping off our pads, so when we got up, we did not feel that rested. Luckily the first part of our day was downhill on a soft forested trail. It seemed to be a long downhill despite what the map had said. 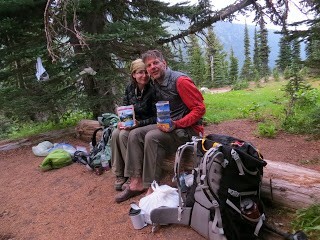 Finally, after what seemed eternity, we arrived at White River Ranger Station and picked up our cache. After short refreshment, we hit the trail again. Luckily it was flat for next mile or so, giving our bodies an opportunity to adjust to the increased weight. 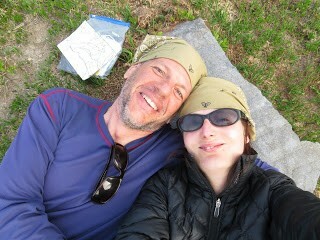 We were happy to arrive at the intersection with Summerland Trail. 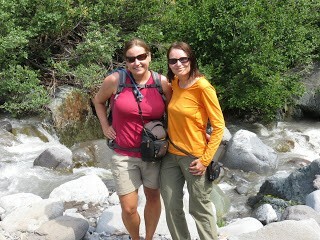 We hiked this part several times before, and knew it was a reasonably easy hike….. that is with a daypack. Now weighted down, the trail seemed much longer. Switchback after switchback, we steadily gained elevation, hoping the creek we wanted to refill our water and chill by was just behind the next corner, and many times the trail tricked us into believing it must be right there just to reveal several more hundred feet of uphill and yet another switchback. Eventually the creek came, rushing down swiftly, carrying light breeze that cooled us off. 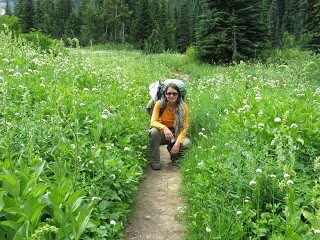 And as we were resting, down the trail came Ingunn Markiewitz. What a nice surprise! After several minutes of catching up and taking photos, she continued on her way back, and we resumed the climb, taking our time to admire the blooming meadows, and views of Little Tahoma, hoping to catch a glimpse of the Summerland Bear but we had no such luck. When we arrived to the camp, surprisingly none of the other groups were there yet. We found a site we liked, way back with a partial view of a meadow, and after we settled in and did our daily chores (washing etc), we wandered up the trail and spend hours watching marmots playing in the meadows of Summerland.